In today’s increasingly competitive global economy, medical device manufacturing companies are continually seeking ways to drive down production costs and accelerate time-to market. At the same time, improved product quality and manufacturing consistency are absolutely essential; there can be no shortcuts when a patient's life and well-being are at stake. Medical device manufacturers turn to advanced induction heating technology to help meet their production, cost and quality goals. Induction heating is a quick, clean, non-contact method of inducing heat for a wide variety of metal joining and heat treating applications . When compared to convection, radiant, open flame or other heating methods, induction heating offers substantial advantages. With a 20kW power supply, induction heating can be used to heat steel tubing to 2000°F for annealing at a rate of 1.4 inches per second. With the right coil design, it is possible to braze three joints at once. In ten seconds, three joints on a dental prophy jet assembly were heated to 1400°F for brazing with improved yield consistency and reduced cycle time. Consistent, repeatable results were achieved at 500°F with a 10 second heat cycle. The electrical connector was firmly bonded to the plastic shell without any flashing or discoloration. 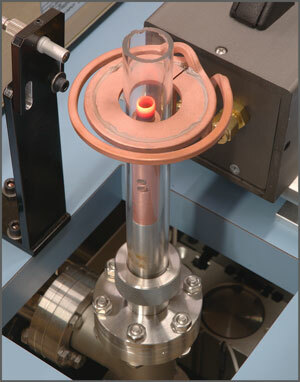 Induction heating provides quick, clean, precision heating.